I started writing this blog a little over two years ago. It began as a way for me to record my family history for a small circle of my own family. Since I began, I have been surprised by the number of people who have read my blog, over 88,000 and counting. I get frequent comments from readers, mostly positive, thank goodness, but I have had the occasional negative comments as well. One thing that I have come to realize is that to defend my writing against those who disagree with my content, I need to do a much, much better job of annotating my findings. With that in mind, I have decided to rewrite almost all my blog postings and include a bibliography. So to all you folks who having been dying for my next installment of the Munning family, (VBG) I'm afraid you will have to waiting until I get this mess cleaned up. Thomas Bradbury of York, Maine and Salisbury, Massachusetts was identified as early as 1869 as the Thomas Bradbury who was baptized at Wicken Bonhunt, Essex, England on 28 Feb. 1611. (1) Although there are no documents that tie Thomas the Colonist to the Bradbury family of Wicken Bonhunt, there are multiple factors that make this identification possible. Thomas Bradbury traveled without any apparent family member to New England by 1635 and his May 1636 marriage to Mary Perkins, implies that he had reached his majority by that time, making him the right age. (2) Thomas Bradbury of Wicken Bonhunt was the son of Wymond and Elizabeth Whitgift. (3) The first child, a son, of Thomas and Mary was also given the highly unusual name of Wymond. (4) Each of their subsequent children share the name of a family member of either Thomas or Mary. Wicken Bonhunt, also know as Wicken Bonnant, is a small village to the south of Saffron Walden, bordering the villages of Newport and Claverings. In Saxon times it was two separate manors, Wicken and Bonhunt, but it was combined into a single unit in Elizabethan times for tax purposes. (7) The Manor of Wicken was purchased in 1557 by Matthew Bradbury, Thomas’ great-grandfather and would become the family seat for several generations. The parish church of Wicken Bonhunt is St. Margaret’s, but the village is also home to the Chapel of St. Helen, a 10th century building that one of the oldest surviving buildings in the east of England. The chapel would have been over 500 years old when Thomas was born. The family also made use of the parish church in the nearby village of Newport Pond; Thomas’ siblings William and Anne were both baptized there. About 1600 William Bradbury built a house on his property for his son Wymond, it was and is called The Brick House. On 24 June 1605, Wymond married, in London, at St. Michael’s church on Crooked Lane, the twice widowed Elizabeth Whitgift Cole Gill. Wymond’s brother Matthew was married to Jane Whitgift, her sister. Henry’s eldest son John is said to have begun his education at Wellow Abbey and later attended Cambridge University. 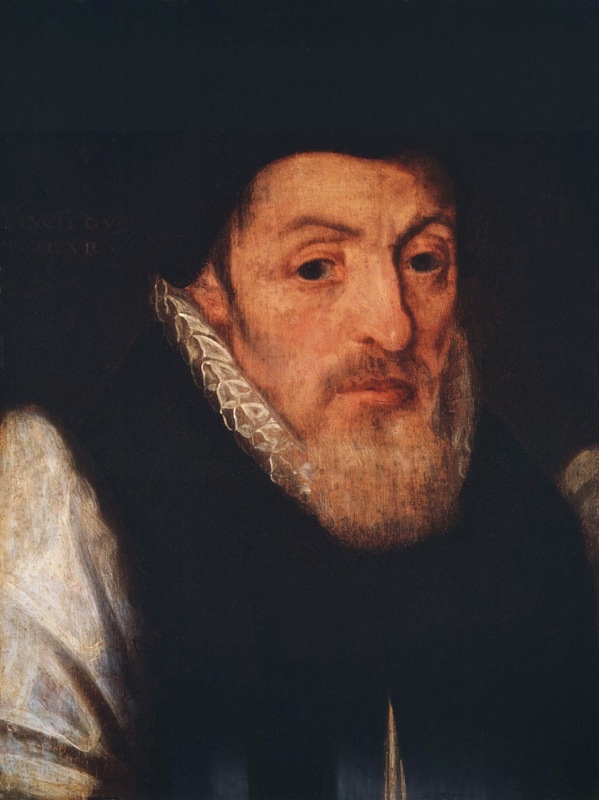 Like his Uncle William he chose a career in the church, not the Catholic Church of his uncle but the newly formed Protestant Church of England. He became an ordained minister and would rise through the ranks, eventually becoming the Archbishop of Canterbury in 1583. As Archbishop he would be the confessor to Queen Elizabeth I and was at her bedside when she died. He also crowned her successor King James I. John Whitgift never married and he shared the wealth he accumulated with his family, including Elizabeth Whitgift. Nothing much seems to be known about Thomas’ life prior to his emigration to New England. We do know that his mother died when he was quite a young child. There is no indication that his father remarried, but that doesn’t rule it out. His parents married in London and his father was living in London when he died, so it is entirely possible that Thomas too lived in London. It is also not known how or when Thomas met and became employed by Sir Ferdinando Gorges. Gorges was a career soldier who was knighted for his service at the Siege of Rouen in 1591. He was the Governor of the Fort at Plymouth for many years. In 1606 King James I founded the Plymouth Company with the intent of establishing settlements in New England, Gorges became a shareholder in the company. In 1622 he and John Mason were given an enormous land grant which they split between them. Gorges’ half became the state of Maine. Sir Ferdinando Gorges never traveled to New England but employed several men to act there as his agents. Thomas Bradbury was one of those men. Sir Ferdinando Gorges’ interest in New England seems to have been for financial gain and not religious fervor. Was that the same for Thomas? The first evidence of Thomas in York, Maine is a deed he wrote on 5 May 1636. (13) It is not known when or where he met Mary Perkins or when or where they married but, their first child was born 1 April 1637, so they were at least married by mid 1636. (13) It is probable that at least the first two of their children were born in York, Maine. By 1640 he was living in the Massachusetts Bay Colony in the newly founded plantation of Salisbury. On 13 May 1640, Thomas swore an oath and became a freeman of the Massachusetts Bay Colony. (14) In order to become a freeman, Thomas had to have been a member of the church. It would be interesting to know if he had previously been of the puritan persuasion, had he come to believe it or did he just recognize the need to belong to the church in order to get ahead. It is interesting to note that his Great Uncle, the Archbishop of Canterbury despised Puritans. In any event Thomas immediately became a very active and important man in Salisbury and the Colony itself. He was the town clerk and recorded some of their earliest documents. He was a school teacher, soldier, justice of the peace, juryman, judge and county recorder. (15) He was known as Mr. Bradbury in deference to his status. In fact he seems to have been the ideal immigrant. Pike, he d. 7 April 1669 on the Island of Nevis, age 32. As successful as Thomas and Mary were, they could not protect their children from the ravages of early death. Of their 11 children, six died by the time they were 32. Two son died on islands in the Caribbean in the same year. Although this was not unusual for the time, it must have been extremely difficult to bear. Unlike some of their children Thomas and Mary both lived to a great old age. Thomas died first on 16 March 1694/5 at the age of 85. Mary outlived him by five years and died on 20 Dec. 1700, she too was 85 years old at her death. I deliberately left out Mary's ordeal during the Salem Witch Trials as she is the subject of my first blog article, which I will like to once I have rewritten it. If you think I have anything wrong here, please let me know, in a nice way! Thank you for reading and please do not copy this article. (1) Bradbury, John M. Esq, "The Whitgift Bradbury Family", The New England Historical and Genealogical Register, Vol. 23, 1869, p. 263. Robert Charles Anderson and John B. Threlfall in their article, Ancestor Table for Thomas Bradbury, state that Thomas and Mary Perkins were married about 1636. 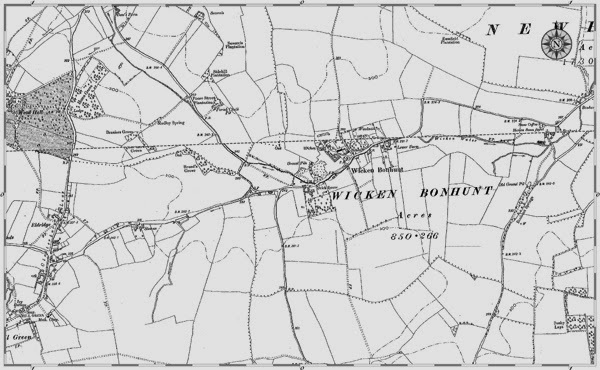 (7) "Local History of Wicken Bonhunt Village in Essex." Local History of Wicken Bonhunt Village in Essex. N.p., n.d. Web. 14 Feb. 2014. (10) Threlfall, John Brooks. The Ancestry of Thomas Bradbury (1611-1695) and His Wife Mary (Perkins) Bradbury (1615-1700) of Salisbury, Massachusetts. Madison, WI: J.B. Threlfall, 1988. Print. (16) Ibid 14, Anderson says that on 13 May 1637 Thomas Bradbury and William Hooke wrote to Governor John Winthrop asking for a Minister for York, Maine. Learn how to cite your sources like a professional with Elizabeth Shown Mills Stripped Bare Guide to Citing Sources available at Amazon.com by clicking the link.